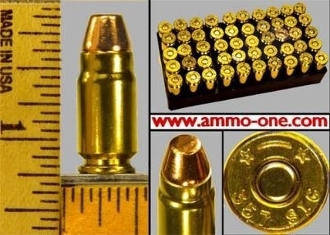 One Box of 50 cartridges: .357 SIG, new by P.C.I. with new brass (not reloads) and loaded with a 124 grain FMJ (full metal jacket) projectile. History of 357 SIG Cartridge: The 357 SIG was introduced in 1994 in a joint venture between Federal Cartridge Company and Sigarms Company by necking down a 40 Smith &Wesson to .357 caliber or 9mm. This created a small cartridge equal to 357 Magnum energy levels in a small semi-auto pistol; however, only the projectile velocity is better than the 40 Smith & Wesson.